There are many types of martial arts in Japan, some of which have quite a few successful, professional players from overseas. 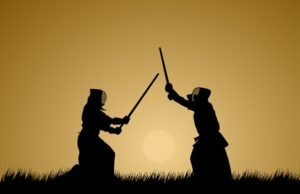 Japanese martial arts are now growing and developing as sports, but traditionally, they were used as techniques to fight a war. Therefore, they were more practical back then, compared to what they are now. 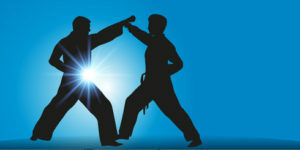 In the peaceful time, the martial arts became not something to just train oneself physically, but also mentally. After the WWII, influenced by the GHQ, their sport element have been empathised. Among Japanese martial arts, Ju-Do has especially many strong martial artists from overseas. Originally, it was designed for the battlefield, particularly, to self-protect when one is unarmed. It was then made into a sport by setting some rules so that there will be no real dangers during the games. In Ju-Do, you keep your balance while attempting to force other person to lose their balance. In this way, even a small person can throw a big person. Therefore, Japanese people, who are relatively small, can play with big players from overseas and they also do well in international matches. Sumo is very old traditional Japanese martial art and often referred as a national sport. It is said to have over 1500 years of history. In fact, Sumo is mentioned in many ancient texts. Initially, Sumo was a ceremonial thing, but as time went on, the current style, putting Mawashi and playing on the field called Dohyo, was established. This professionalised Sumo. Since then, Sumo has become a heart of Japanese cultures and continued to flourish. Although the contents of the Sumo sport are very simple (you will lose once you fall or pushed out from the field), there are countless skills and techniques that are required, which makes it a very exciting sport to watch. The origin of Karate-Do, often referred as Karate, is believed to be the meetings of different martial arts, such as Kenpo and Chinese Kenpo that were practiced among indigenous people in Okinawa and other Japanese traditional martial arts. Punching and kicking are the main ways to attack. There are many Karate learners overseas. Also, despite the fact that it was quite recently introduced to Japan, there are many people learning it and there are many different styles with different sets of skills that have been established. Depending on the founder of each style, the starting pose and the uses of techniques are subtly different. Therefore if you get a chance to watch some Karate game, do pay some attention to those differences. You might know about the famous Japanese Katana (sword). Kendo is a sport that was developed from Japanese fencing. However, with Kendo, the bamboo swords are used instead of the real swords. Also, the aim of the game is to hit the head, hands or hip of the other person with those bamboo swords. Like many other Japanese martial arts, Kendo facilitates the mental development. In fact, before and after the game, players bow to one’s opponent. Moreover, the Kendo players do not even show their emotions after they win the game. In fact, there are many rules regarding the courtesy (Reigi) in this sport. It can be said that this reflects the character of Japanese people who have a special connections to Bushido (the famous philosophies for the samurai). Many people think of swords when they picture the Japanese battlefield, but the bow and arrows were also widely used in Japan just like many other countries. 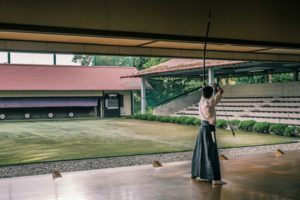 Like archery, which became a sport, Kyudo was developed into a sport that uses a bow and arrows and has been continually played until this day. However, there are various differences between Kyudo and archery. For example, the arrows used in Kyudo are very simple and there are no set regulations. This means it takes a long time to get them hit the target. In addition, it has a stronger element of training oneself mentally in Kyudo and therefore, there are more rules regarding the courtesy. Aikido has the same origin as Judo. It is unique in using the power of the other person rather than one’s own to throw them. There are no skills to directly attack the pt her person. Instead, there are techniques to throw the other person or to make the other person unmovable by holding their joints which would stop their movements without actually hurting them. Because of this, even people who are not very strong can take the control of the powerful opponents. Therefore, this sport is not only popular to train oneself mentality, but also for the purpose of self-protection. In fact, many women do Aikido and you can find many women training in the Aikido classes. Moreover, it is lately getting popular to do Aikido to keep oneself healthy, especially since Aikido can be done regardless of the ages and the level of the fitness. There are many male and female players for Japanese martial arts now, but originally they were exclusively for men. In fact, many of Japanese martial arts did not have female players at all. However, Naginata was an exception and many women played it since it was started – it was actually first started as a martial art for women. Naginata is a long stick with a knife on the edge. It was first invented to be used in the fighting, but as arrows took over, the unused Naginatas were given to women to let them prepare for the times when they have to fight themselves. Lately, Naginata is introduced to other countries and the international matches are being held. As introduced here, there are various martial sports in Japan and each one of them can strengthen oneself both physically and mentally. There have been classes opened overseas for the popular ones, producing many good players, so if you are interested in at all, please do try one yourself.